The initial package includes one full day on-site workshop for 20 people and remote coaching during three months to ensure the effective adoption of the capabilities developed during the training. It can be expanded both by adding more workshops or by extending the coaching period. OKR at scale: Support for a full OKR implementation at scale. Executive overview: Learn about OKR before committing to implement it and evaluate if it is a good fit for your organization. Interested in Onsite OKR Workshops? Set: Creating OKRs that are valuable, engaging, and actionable. Align: Ensuring that each team aligns with the others and to the company strategy. Achieve: Regularly tracking and acting upon the OKRs to reach them. During a full day workshop, participants will learn the OKR fundamentals through a series of hands-on exercises. Setting tactical OKRs aligned to the organization’s strategic OKRs. Value-based Key Results vs. Initiatives. Creating shared OKRs and 360º alignment between multiple teams. Using the weekly cadence to track and improve OKRs. The need to balance Key Results to avoid perverse incentives. Using proxy metrics, leading indicators, and lagging indicators. In the second half of the workshop, attendees will create drafts of the company and team OKRs, with my support. One of the major challenges of any training or consulting engagement is perpetuating change and ensuring that the client incorporates it. To solve this issue, we will educate a team of OKR Champions, employees who act as focal points for the OKR practice inside the client. They will attend a 60-minute additional training session. OKR Champions are a blend of evangelists and PMOs that facilitate cultural change. Their mission is to ensure that the organization has continued success with OKR. One of our goals during the engagement is to develop the OKR Champions so that they can lead the OKR practice. Therefore, they will be responsible for the day to day support for the teams, with my guidance and coaching. After the workshop, attendees will review the OKRs and align them with the other teams. 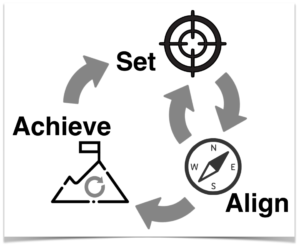 Using the 360º Alignment tool presented in the workshop, they will map dependencies, create shared OKRs, and ensure both vertical and horizontal (cross-team) alignment. It usually takes teams 2 to 3 weeks to refine and align their OKRs. During this period, I will have weekly calls with your team for follow-up. Your company will also have unlimited access to phone and email to answer questions. Adopting ceremonies for tracking results is crucial to OKR success. The goal is not to add more meetings, but to make them more productive and focused on delivering value. The OKR Check-in is a weekly ceremony for OKR follow-through, and it is at the heart of the Achieve step. I will teach you how to conduct the Check-ins. It is essential that your team learns how to perform Check-ins on their own so I will facilitate the ceremonies in alternate weeks. Your company will continue to have unlimited access to email or phone for questions. Lean Performance will also provide an OKR tracking template.